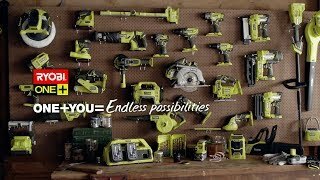 The Ryobi One+ 18V hedge trimmer brings precise cuts to the One+ system. Featuring 18 inch dual-action blades for reduced vibrations and user fatigue, it makes it easy to maintain your shrubs and hedges. The rear rotating handle allows for cutting at different angles, while the 18mm cutting capacity and 500mm hardened steel blades provides for efficient and effective trimming.